Our newest design! Extremely classy and fitting to any type of ceremony. This design has black and white swirling at the top and bottom of the candle with black double edge organza at the base. The bride and groom's names are on the main candle, together with 'married' and the date. The two family candles have the family name and the date. 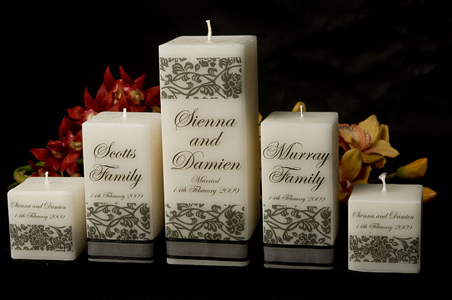 Two gift candles accompany the set showing the bride and groom's names and the date of wedding. There is no ribbon on the two smaller candles. The candles come packaged in cellophane. The set size is as follows: bridal candle measures 225mm high x 90mm,the family candles measure 150xm high x 75mm and the gift candles measure 75mm x 75mm.